It was my first time in Boise and now I can finally add another state to this blog. I highly recommend visiting in June, due to the pleasant weather around mid 80’s each day. Warning- the weather changes rapidly, as one day we were wearing shorts and froze. During my short stay there, Boise seemed to be a rather small, quaint, laid back town. People were friendly and it felt very safe! I loved downtown Boise, with building after building made of red, brick with flower boxes hanging out of the windows from above and at street level. 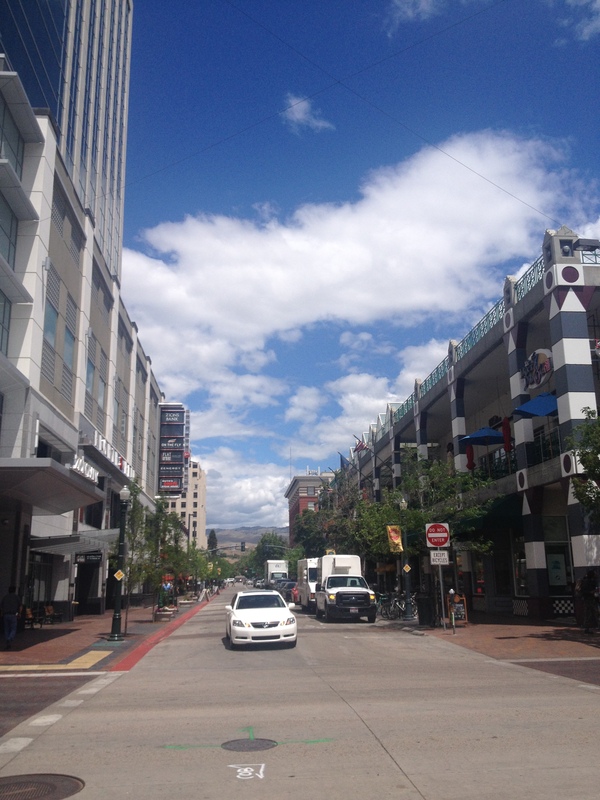 Downtown Boise is historic while modern at the same time, with bistros, cafes and cute shops. Family friendly, walking paths and just a vibe that felt good. Without time to research restaurants, we took to the streets of downtown in search of a place to eat. It is very simple to find your way away around, albeit there are a lot of one way streets. Parking garages are everywhere, many offering the first hour free. Parking fees are relative, but I thought it was extremely cheap – around $2.50 for 2 hours ($12 max per day). While walking around downtown looking for a place to eat lunch, we stumbled upon cafe after cafe. Having a difficult time choosing a place for lunch, we peeked in some of the cafes and kept on walking until we saw Fork. 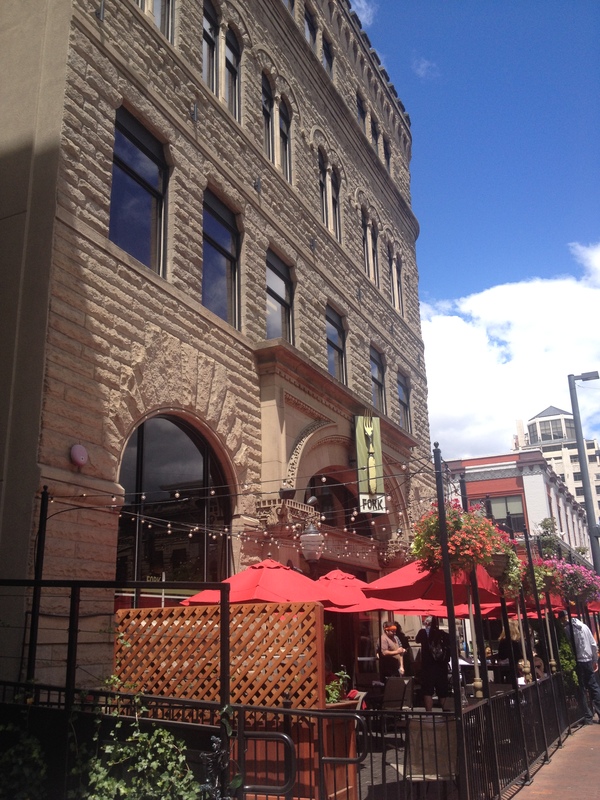 The building, one of Boise’s oldest downtown landmarks and formally Boise City National Bank, is made of tan brick on the outside with vibrant red umbrellas, lattice siding and hanging plants on the patio. Located at 199 N. 8th Street, just steps from Idaho’s Capital Building and Capital City Market. We smelled the restaurant before we saw it. We stopped and read the menu and instantly noticed gluten-free and vegetarian options displayed. We also had a stroller in our party and needed to have a spacious area to sit while dining. 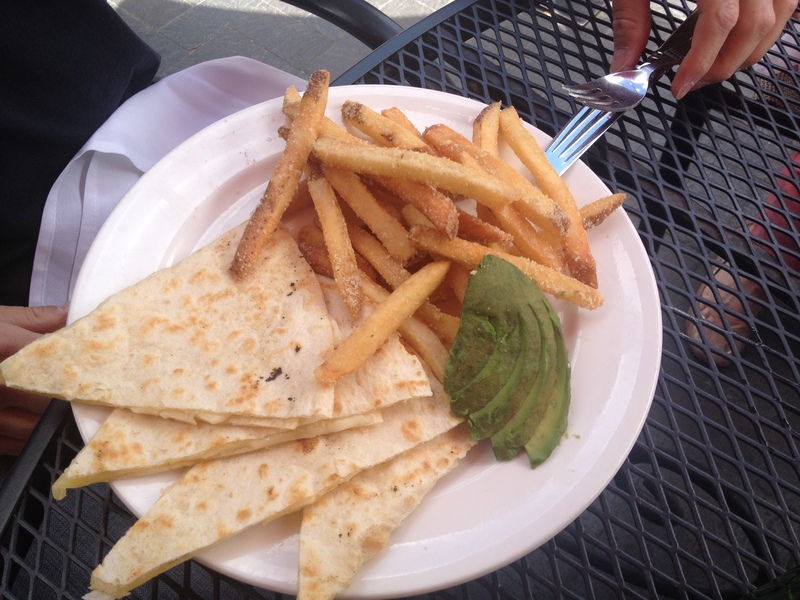 I am a “foodie” and appreciate sidewalk cafes and the farm-to-table concept. 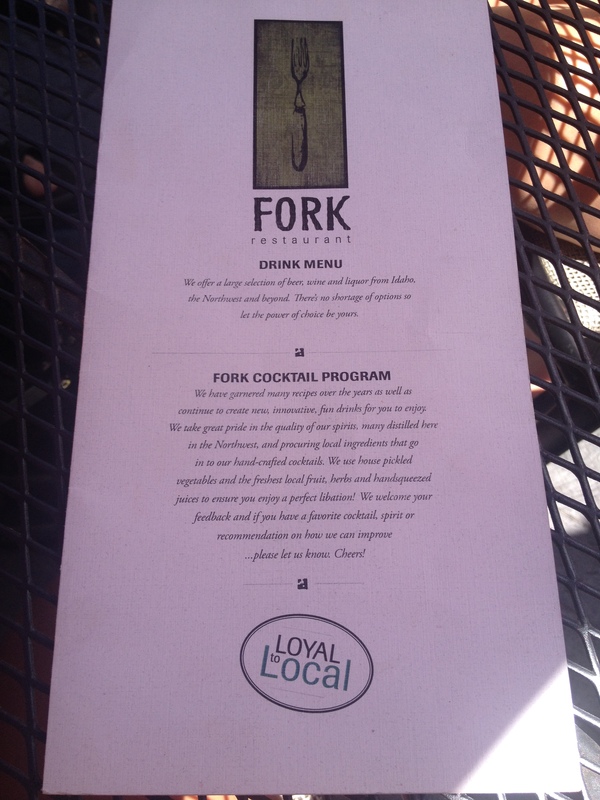 Fork has developed a “Loyal to Local” theme with a commitment to using local produce and cheeses for their main ingredients. If you love local beers, you will be pleased to know that 75% of the beer is from the great Northwest region. I ordered a draft, light beer which was quite refreshing. Notice the sawed off, recycled wine bottles which are used for water glasses . The tables are also made of recycled materials and they have a vault located on the bottom floor. First off, the Urban Burger & Fried Asparagus looked amazing! The Urban Burger seems to be the fan favorite at just $8.95 made of brisket & ground sirloin and topped with Fork’s special burger sauce. Add-ons include spiced maple bacon, Tillamook Cheddar or onion ring. Unfortunately, we did not order either of them, but turned heads each time the server walked past our table carrying these dishes. 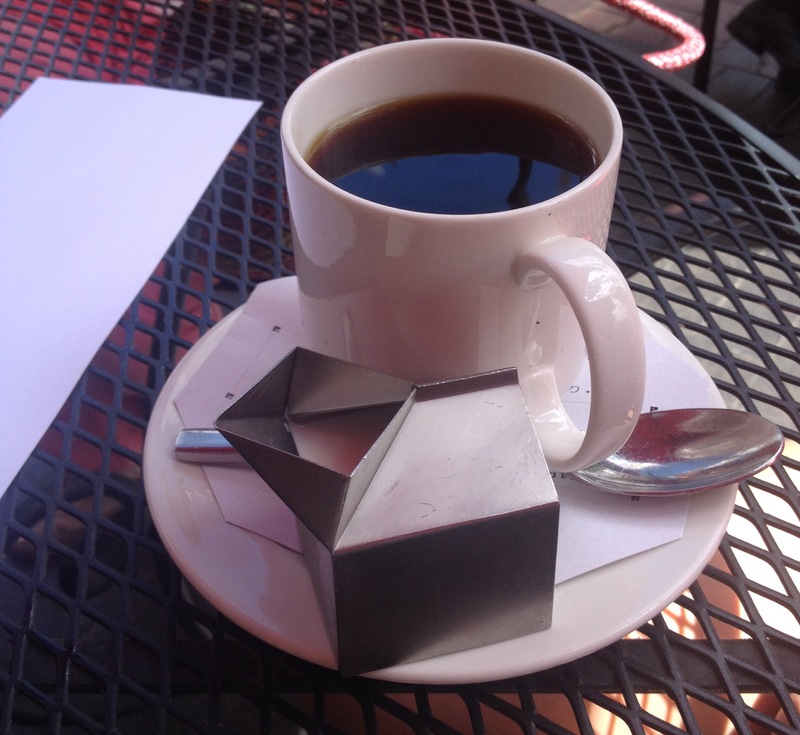 If you are in the mood for coffee, they have a great dark roast, served in a mug with a metal cream mini carton. Gotta love the presentation. At $3, you are allowed one refill, a pretty good deal. Other lunch items offered are the Grilled Wild Salmon Fillet, Roast BBQ Chicken (free-range), BAM Sammy (bacon, avocado, mozzarella, tomato, basil), Prime Rib French Dip, and the Snake River Farms Kurobuta Pork Cuban. 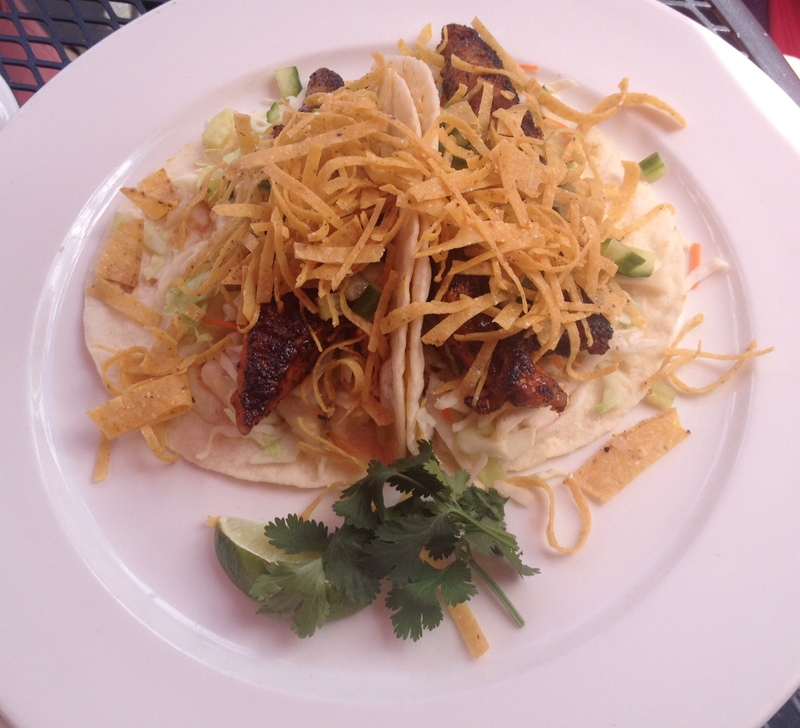 We ordered the Pacific Coast Fish Tacos (pictured above). They were made with catfish, which can taste like dirt if not prepared properly. The catfish was flavorful, using a blackened seasoning and not fishy tasting at all. Light and crisp, served on a white, corn tortilla with shredded cabbage and a lime wedge. The Grown Up Grilled Cheese sandwich hit the spot for me. I really can’t say enough about it! 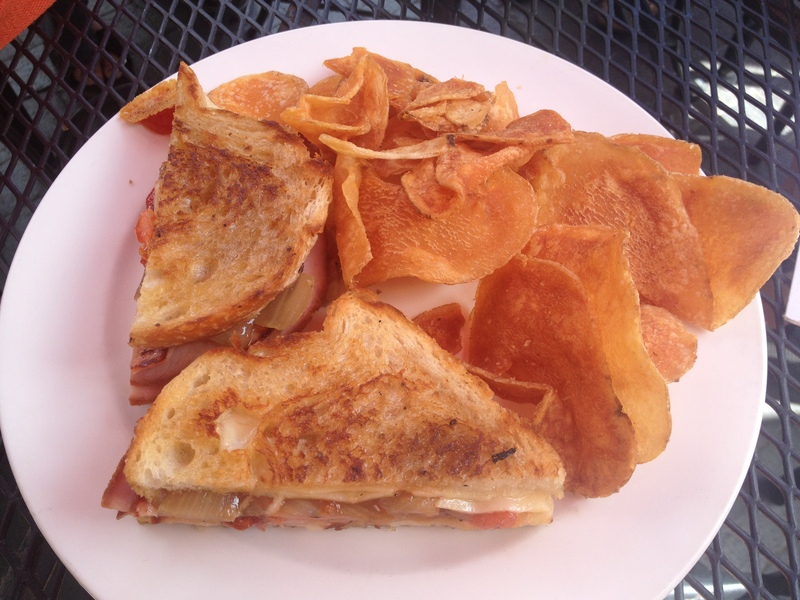 The yummy, grilled sourdough bread, thick ham slices, balsamic-braised onions, with Ballard Farms Cheddar and tomato jam! It was the first time I had every had tomato jam, much less heard of tomato jam. It was really sweet and tangy. What more could you ask for? The ultimate comfort food. 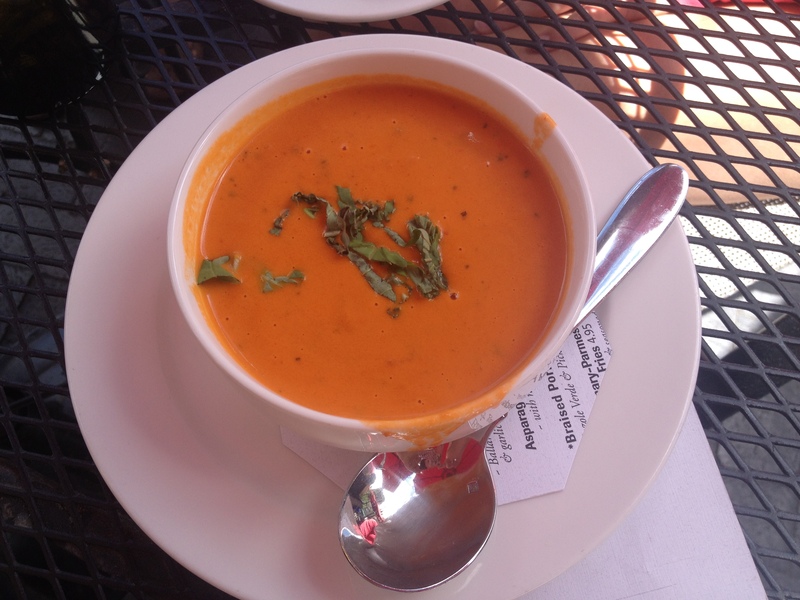 Here’s what you could ask for- tomato soup for dipping! Order the tomato soup if you order the Grown Up Grilled Cheese, just saying. You can’t have a grilled cheese, no matter how fancy it is, without a bowl of tomato soup. Just bring the kid in you back out while dining at Fork. Why not? The best part- it’s only $7.95! The chili lime potato chips are made in house. For dinner the entrees include Apple-Barrel’ Chicken , Cast Iron Buttermilk Fried Chicken & Cheddar Waffle (another fan favorite), Wild Mushroom & Local Herb Pesto Ravioli, Idaho Rainbow Trout (Hagerman Farms trout), Alaskan Sockeye Pan-Seared Salmon, Napoleon Vegan Plate, Local Ale-Braised Short Ribs (Northwest beef), Braised Snake River Farms Kurobuta Pork Shank, Filet 7oz, Grilled Northwest Flat Iron Steak 8oz,Herbed Rack of Lamb, and Prime Rib 14oz. For dessert~ You must try Fork’s Signature Warm Butter Cake, topped with vanilla ice cream and Oregon berry coulis for just $9.95. It is large enough to share with friends. Experience Build Your Own Bloody Mary Bar on Saturdays & Sundays from 10:00am-3:00pm.